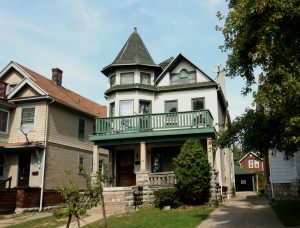 Buffalo’s University District may soon be home to a new National Register historic district thanks to a $10,000 Preserve New York grant awarded to the University District Community Development Association (UDCDA) by the Preservation League of New York State and New York State Council on the Arts. The $10,000 grant will allow the UDCDA to work with kta preservation specialists, a Buffalo-based preservation consulting firm, on a reconnaissance level survey of four neighborhoods within the University District. The project area consists of four distinct neighborhoods. 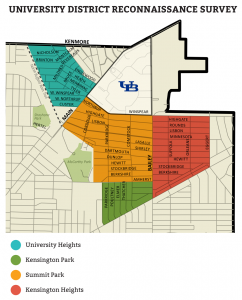 The reconnaissance level survey would focus primarily on the University Heights, Summit Park, Kensington Heights, and Kensington Park neighborhoods located within the University District. Constructed between 1900-1940, these neighborhoods were some of the last to be developed within the City of Buffalo’s boundaries. 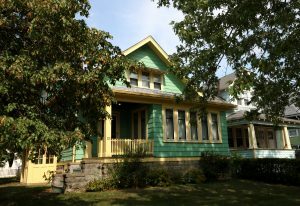 They represent a diverse mix of styles, including American Foursquare, Colonial Revival, and Workmen’s Bungalow and developed thanks to the expansion of the city’s streetcar system and development of the University at Buffalo. “We are thrilled to be working with the UDCDA on this project, and we’re already in the process of uncovering some exciting history about the establishment of the neighborhood by multiple real estate developers. The University Heights district contains a substantial amount of early-twentieth-century architecture that demonstrates its historical significance as a series of planned residential subdivisions at the northern edge of the city from 1900-1940” said Annie Schentag, Consultant with kta Preservation Specialists. A workman’s cottage in the Kensington Heights neighborhood retains many of its original details. The survey will include a field study looking at the architecture and design of each neighborhood, in depth historic and archival research looking at the development of each neighborhood, and an analysis of the historic trends and themes that influenced the social, cultural, economic, political, and industrial growth of the area. Kta will also identify a potential National Register district within one of these neighborhoods to prepare a National Register nomination for submission to the State Historic Preservation Office and National Parks Service. Having seen the positive impacts of the University Park neighborhood being designated as a National Register district, the UDCDA sees the survey work funded through the Preserve New York grant as critical to maintaining strong and vital neighborhoods across University District. “This project has the potential to strengthen our community by building on our unique heritage, while also serving as a foundational step to realizing significant reinvestment in neighborhoods that are most in need” said Roseann Scibilia, UDCDA Executive Director. 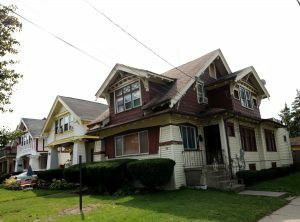 The goal of the survey will be to determine whether any of the neighborhoods under review would be eligible for nomination to the National Register of Historic Places. Once nominated and listed to the Register, homeowners within these neighborhoods would then be eligible for the New York State Historic Homeowner Tax Credit Program, which covers 20% of qualified rehabilitation costs, up to a credit value of $50,000. These tax credits are an important tool in ensuring stability in neighborhoods like those across University District, as both recent and longtime homeowners address the challenges associated with an aging housing stock. By making it more affordable to reinvest in these homes, the UDCDA hopes to encourage new generation of entrepreneurs and community advocates to locate and invest in University District. Smaller housing stock in Kensington Park is no less articulate in its detailing. 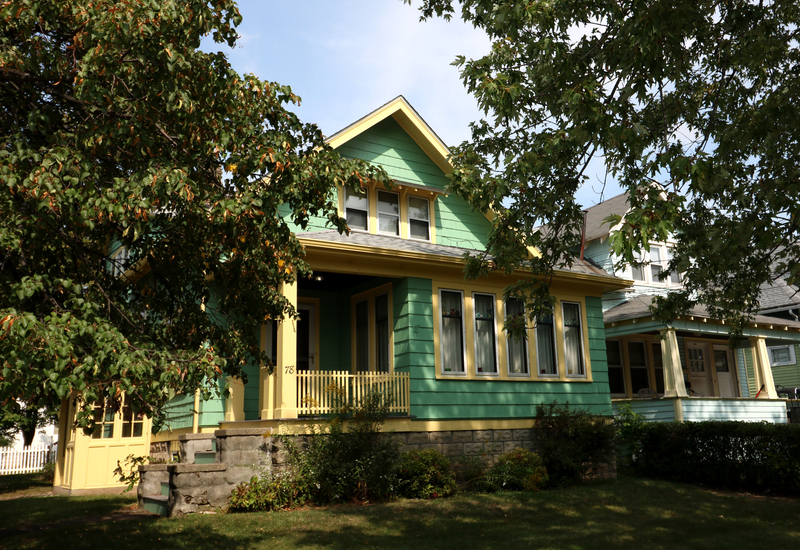 Many partners made this Preserve New York grant possible, including Preservation Buffalo Niagara, the University at Buffalo, and the New York State Historic Preservation Office. The survey builds on a preliminary context survey completed in 2016 by two Masters of Urban Planning students at UB’s School of Architecture and Planning, which came out of recommendations from the Preservation League of New York State and the State Historic Preservation Office. Guidance offered by Preservation Buffalo Niagara also helped link the UDCDA to funding opportunities offered through the Preservation League. 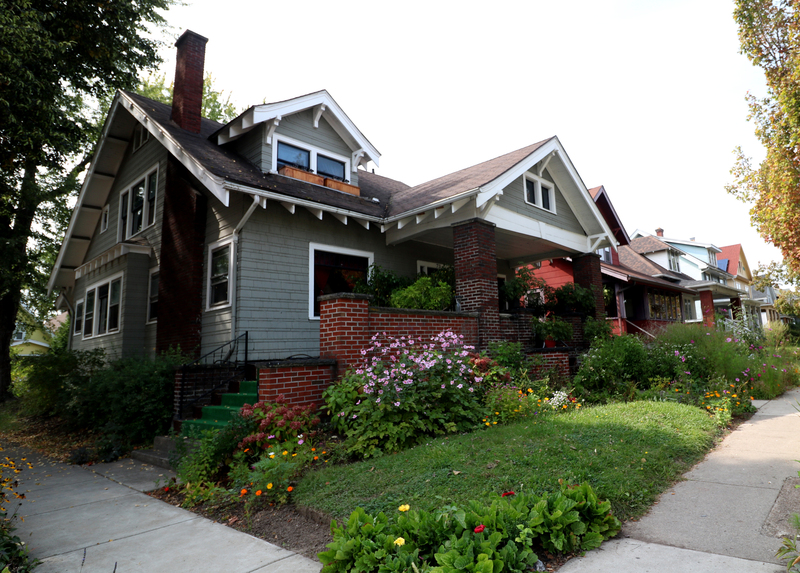 Workman’s Bungalows are a popular style seen throughout the University Heights neighborhood. The Preserve New York Grant Program is a signature grant program of the New York State Council on the Arts (NYSCA) and the Preservation League of New York State. Preserve New York is made possible with the support of Governor Andrew Cuomo and the New York State Legislature. The University District Community Development Association (UDCDA) is a full service agency offering a wide array of youth, teen, and senior service programs to residents out of the Gloria J. Parks Community Center located at 3242 Main Street while also spearheading community and housing development projects throughout Buffalo’s Northeast from its offices located at 995 Kensington Avenue. The agency works with residents, block clubs, businesses, community nonprofits, educational institutions, and local government to invest resources in the people and places that matter most to the community.